The third chapter of the Chronicles of Narnia “The Voyage of the Dawn Treader” was a 900+ shots project for MPC and this was the first time I was leading a team for them. At that time the company plan was to slowly introduce Nuke in the compositing department at first, but I became convinced that my team could learn this software quickly enough to use it for 2.5D DMP projections and pre-comps. 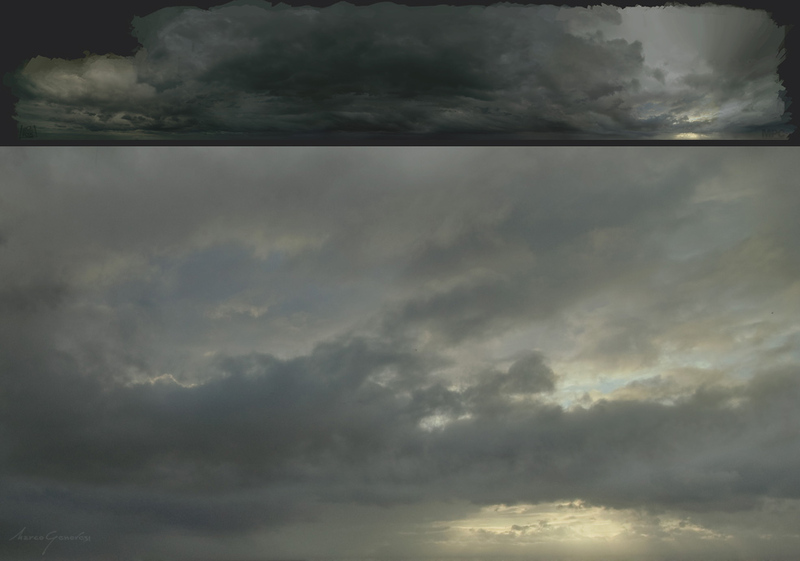 In fact the majority of the set extensions and sky replacement ended up being projected and rendered directly in Nuke. The team size varied during the length of the show but I had to manage up 13 people at the same time. So, I ended up using my days to attend meetings, dailies, troubleshooting technical problems and making one to one reviews with the artists, whilst I was working on my shots at night. Evil Mist // Concept Art. One day the VFX supervisor Adam Valdez called a meeting with all the leads to have a brainstorming session about what we called “the evil mist” (a dark entity able to materialize the fears of the people traveling through it). At that time it wasn’t clear how this place was supposed to look like. So, I proposed to picture it as a gigantic cavern created by a network of humongous pillars, made of dense fog, which exchanged electrical charges working as the synapses of a brain. That evening I spent a few extra hours at work and I made a concept to share my vision with the rest of the team. Luckily, the image made a good impression and it stuck with us for the rest of the show, becoming the main reference for that set. Evil Mist // The top image shows the the full cyclo, whilst the bottom one pictures a detail of the entrance to the same environment. I was also very excited to work on the cyclo for this environment, laying down the basis for all the work that FX and COMP made later on. 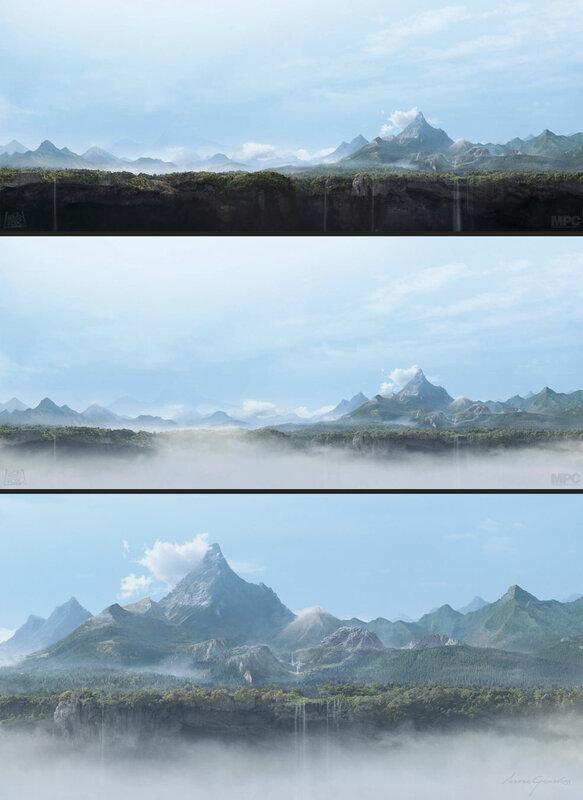 This matte painting was a very large 24K image with a few layers to allow for some 2.5D parallax. After mapping it onto simple geometries, the Nuke setup was handed over to the compositing team. Aslan’s Country // DMP before compositing. At the end of the film the main characters travel toward the never ending wave that separates Narnia from the Aslan’s heavenly Country. So, I was asked to create a cyclo for that, whilst I was provided a quick pen sketch from the client which depicted a few mountains floating above a sea of clouds. I spent a few days on this image as I wanted it to be the aggregation of different places in the world, including the Matterhorn (a mountain of the Alps, straddling the main watershed and border between Switzerland and Italy), as an homage to my country. 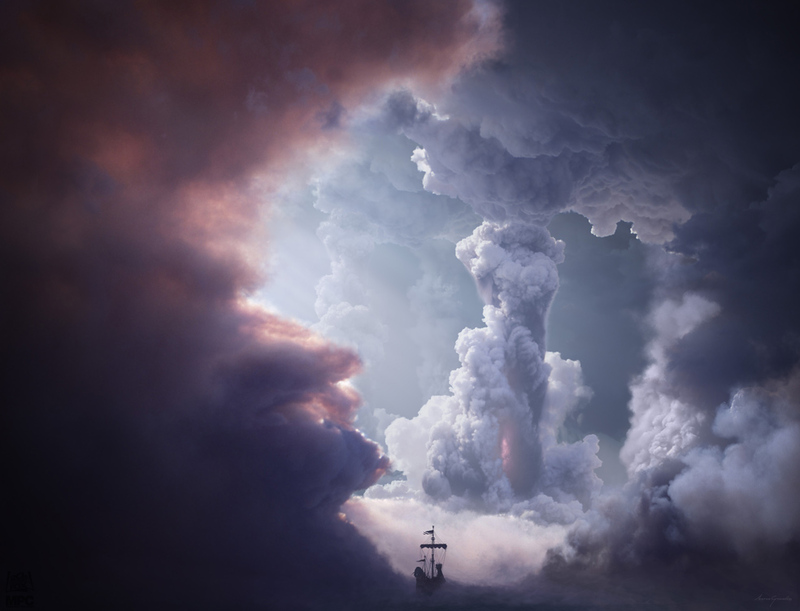 In the final shots this matte painting was only used as a faint mirage behind the wave. However, you can find it here in it’s original look. Storm cyclo // DMP before compositing. 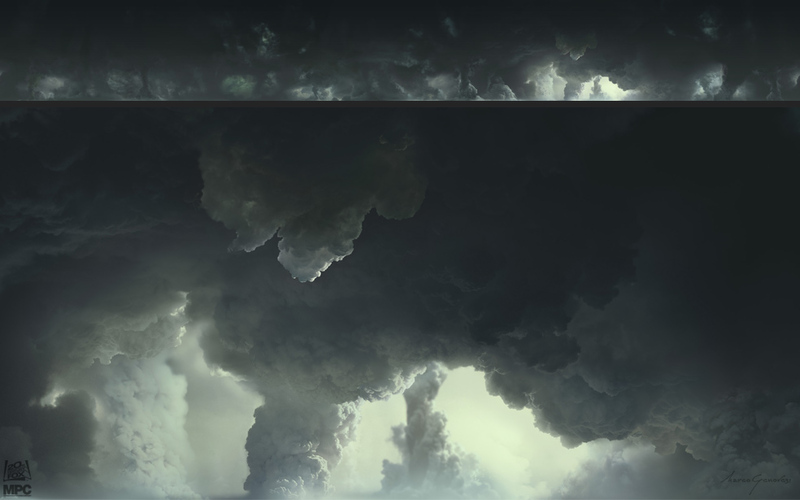 The storm sequence featured a few one-off matte paintings as well as a large cyclo, which I created as a multi layered image to allow for some parallax and cloud animations. I was also implementing some lightnings, which were animated in Nuke.